Valiyaparamba Backwaters is one of the best scenic backwaters available in Kerala. Flooded by 4 rivers this backwaters includes many small small islands. Nowadays this scenic area provides houseboat facility to cruise through the natural lake beauty. The Bekal Resorts Development Corporation provides houseboat services on the Tejaswini River from Kottapuram in Neeleshwaram to Kannur, along the Valiyaparamba Backwaters. (These Houseboats are single bedroom and two bedrooms. The cruise time varies from an hour to a full day including overnight cruises also. 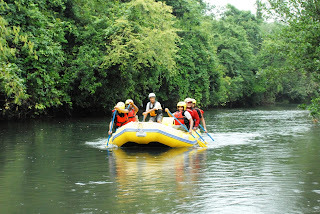 This is highly recommended as it costs much lesser if you go on similar activity in South Kerala. Actually Tejaswini river is the border that divides Kannur and Kasargod into two. River Tejaswini, also called as Kariamkode Puzha, originates from the Brahmagiri Hills (in Coorg) enters Kerala near Pulingome. It flows through Neeleswaram which provides a major part of water for the exciting natural Valiyaparamba Backwaters(Kavvayi Backwaters) and makes it to be the best in Kerala. Read more about north Kerala Backwater tourism. The longest wooden hanging bridge is over Tejaswini that connects Kannur to Kasargod. The main thing that differentiate the North Kerala Backwaters from the Southern Kerala Backwaters is, the blending of forest beauty with the backwaters is only available in the Northern part. Southern areas backwaters are surrounded by villages, but in Northern part, its all surrounded by the greenery of Wild forest. The sounds of birds, cool breeze, small small islands with rare species of butterflies and plants makes the Northern Kerala Backwaters one of the best in category. Those who think backwaters are only in Alappuzha, please visit at least ones, and change your opinion...! 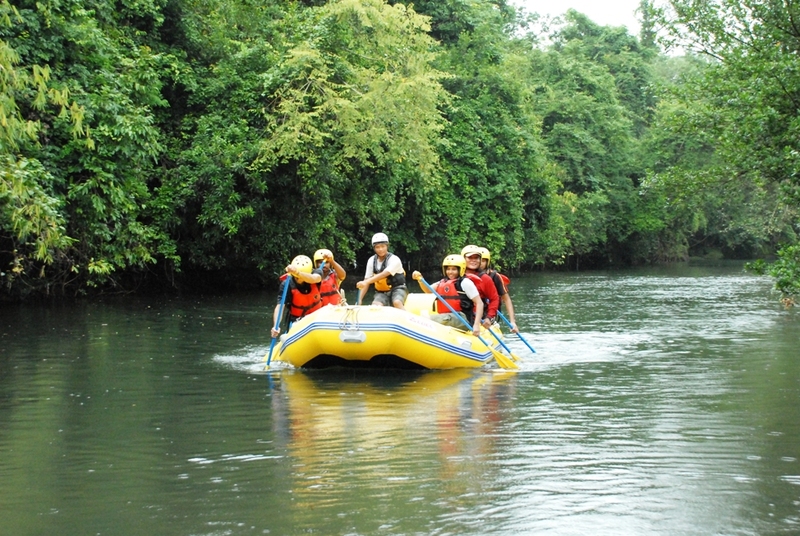 With a 64KMs waterbed, Tejaswini offers exciting rafting area of nearly 20Kms (12-20kms depends on the monsoon). With plenty of cuttings and rapids, its one of the best in category too. 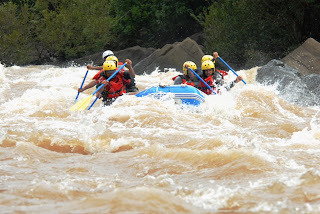 Rafting is not much popular in Kerala, being it is more adventures and the availability of lengthy rafting stretches are not available in Kerala. But nowadays its become more popular in the waters of Tejaswini. The water of Tejaswini goes through the rocky areas curving her hands around them. The water attains speed while on the go with the boats, and the wild sounds with water hitting rocks real images makes this journey a real horror or adventure. Tejaswini flows through the forests of Kasargod and Kamballur to reach Chemmaramkayam, the deepest point in the river. This kayam provide good swirl, and in case of deep rain nobody can escape without going into this swirls of current. Through out the journey one can see branches of trees hanging to the river which also offers seeds of fear in ones mind. Chances of spotting river snakes, which are not harmful is also an amazing experience. The nearly 5 hours rafting will ends at Kakkadavu in Kasargod. 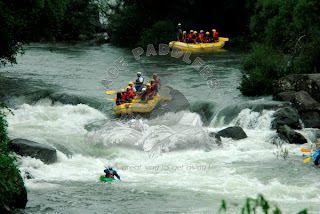 There are many agencies which provides rafting with good and raft trainers from outside Kerala. Also the rafting in Tejaswini came under the category 3, and in case of deep rain it can put under category 4 too. So children above 12 can also participate if parents are ok with that. Exact Location: Cherupuzha, 65 km from Kannur and 35 km from Payyanur. It is on the highway, buses are ther at regular interval to Cherupuzha from Kannur, Kasargod. Monsoon time is the best time to visit here. Accomadations are available in Cherupuzha town itself (100-500rs/day) and good AC lodging facilities are available at Taliparamba, Payyannur, Kannur at reasonable rate. Kaleswari Travels has its own speciality, our main aim is to reach the people in an easy way to book their Bus Ticket.TicketGoose.com has a website, now a days Online Bus Booking is easy with many website, but no one can reach TicketGoose.com.